Despite its small footprint, this family house in Singapore offers a surprising sense of openness. Architects at A D LAB managed to create generous spaces within a narrow volume nestled between densely packed terrace houses, and provide well-ventilated daylit rooms featuring lots of greenery. Although difficult to imagine, considering the constraints of the small site, the house features a vast open space with a central courtyard on the ground floor, skylights, terraces and two external gardens. The architects achieved this spaciousness by tucking away all the main service areas into a semi-basement, leaving the ground floor as an open area connected to the outside. 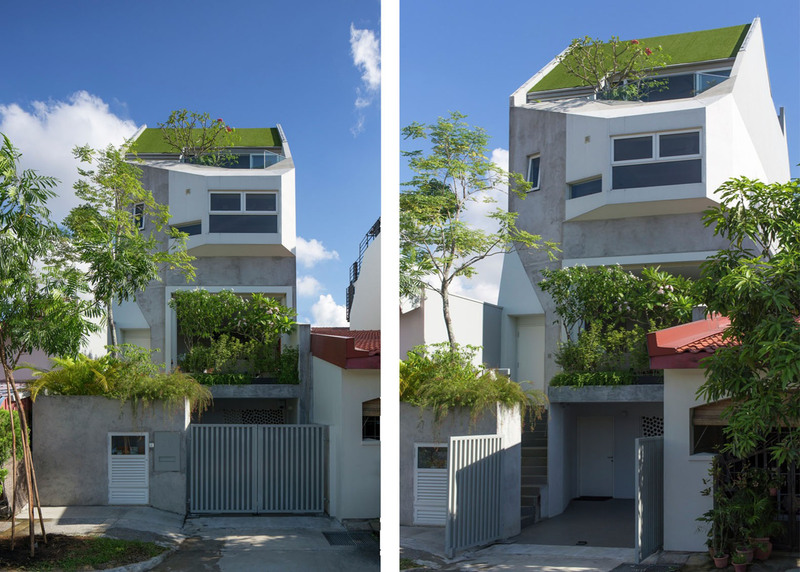 The triple-height courtyard grows a Ficus tree and draws natural light into the building. The central part of the house was transformed into a lush internal garden. Two external gardens surround the main living room, with the front garden functioning as a quiet space located atop the car porch. The rear green area has a small swimming pool connected to the dining room. Thanks to these green spaces, the building offers many of the advantages of a country house, and eliminates the oppressive feeling which accompanies living in densely populated urban areas. Although difficult to imagine, considering the constraints of the small site, the house features a vast open space with a central courtyard on the ground floor, skylights, terraces and two external gardens. The architects achieved this spaciousness by tucking away all the main service areas into a semi-basement, leaving the ground floor as an open area connected to the outside. The triple-height courtyard grows a Ficus tree and draws natural light into the building. The central part of the house was transformed into a lush internal garden. Two external gardens surround the main living room, with the front garden functioning as a quiet space located atop the car porch. 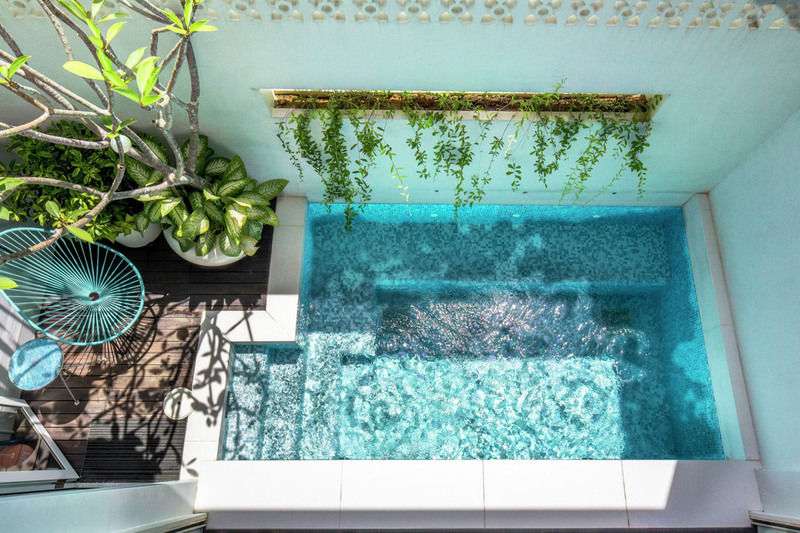 The rear green area has a small swimming pool connected to the dining room. Thanks to these green spaces, the building offers many of the advantages of a country house, and eliminates the oppressive feeling which accompanies living in densely populated urban areas.